Pope Felix IV, Cosmas or Damianus and Saint Paul. Not much is known about the lives of the twin brothers Cosmas and Damianus (Κοσμάς and Δαμιανός in Greek). Tradition dictates that they were born in Arabia, which is most likely Arabia Petraea, then part of the Roman Empire. Cosmas and Damianus both became physicians. They were apparently quite good at their job and apart from curing the sick, they also converted many of their patients to Christianity. For this they were martyred in Roman Syria during the reign of Diocletianus (284-305), although their year of death is uncertain. It is variously given as 287 or 303. Saint Peter, Cosmas or Damianus and Saint Theodorus. The executioners first tried to drown the brothers by chaining them and throwing them off a rock into the water, but they were miraculously saved by an angel. A second attempt also failed: when the executioners tried to burn Cosmas and Damianus at the stake, the flames only hurt the people in the crowd. Then the executioners shot arrows at the brothers, but these bounced back and killed the archers. Finally, the brothers were beheaded. They became the patron saints of medical doctors and are even credited with posthumously performing a tissue transplantation. The brothers were buried in Cyrrhus, Syria, and later their relics were presumably brought to Constantinople and then to Rome. Their cult in Rome may have been intended as the Christian answer to the traditional Roman cult of the twins Castor and Pollux, whose temple was on the Forum Romanum nearby. 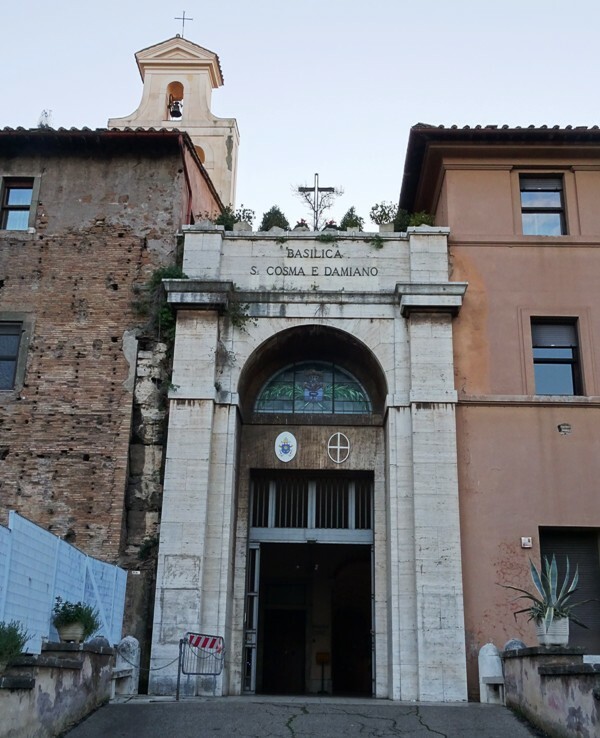 The Santi Cosma e Damiano is a sixth century minor basilica that is partly located on the old Forum Romanum. It is an eccentric church in many ways. The basilica is housed in two ancient Roman buildings, the so-called Temple of Romulus and part of the former Temple of Pax. These buildings have been combined to form a new edifice intended for Christian worship. It worth exploring this peculiar architectural history in some detail. The Santi Cosma e Damiano seen from the Palatine Hill. The Temple of Romulus on the Forum Romanum. The Temple of Romulus is situated on the Roman forum below. The ‘Romulus’ of the temple is not the legendary first king of Rome, but one Valerius Romulus. Little is known about his life, other than that he was the usurper Maxentius’ son and was consul with him in 307 and 308. He seems to have died the next year at an unknown age (some sources argue that he was still a child, others that he was in his teens). His grief-stricken father had him deified and dedicated a temple to him on the Via Sacra. It is this circular temple that we can admire today. The bronze doors are actually original and they used to be closed all day. I have been on the Forum Romanum in 1996, 2009, 2010, 2013 and 2017 and have always found them closed. Recently, the decision seems to have been taken to open them during the day, so that visitors can admire the thirteenth century frescoes. Regretfully I have not had the opportunity to view these yet, and the decision may have been reversed already. Apparently, the claim that this round temple is the Temple of Romulus has come under fire recently. The usually very reliable Churches of Rome Wiki mentions the opinion of professor Filippo Coarelli, an expert on the topography of ancient Rome, who states that the structure is in fact a rebuilding of the much older Temple of Jupiter Stator. I do not feel qualified enough to comment on the validity of his opinion. For simplicity’s sake, I will keep referring to the building as the Temple of Romulus, the name by which this structure is most widely known. The Temple of Pax – the personification of Peace – was built around 75 by the emperor Vespasianus (69-79) to commemorate his victories in Judaea. It was not just a temple, but a temple complex, which is probably why it is often erroneously referred to as the Forum of Vespasianus. In the southeast corner of the temple complex was a large hall that is often called the Bibliotheca Pacis. The name indicates that it was a library, but it may also have been a hall for meetings and lectures. The Greek historian Herodianus claimed that the Temple of Pax was “the largest and most beautiful building in the city”. It was either destroyed or badly damaged during the great fire of 191 or 192 and it was presumably restored after that. During the reign of the emperor Septimius Severus (193-211), a map of the city of Rome carved in marble – the so-called Forma Urbis – was attached to the outer wall of the hall. This wall is still standing today; it is to the left of the current entrance on the Via dei Fori Imperiali. The Santi Cosma e Damiano was founded in the sixth century by pope Felix IV, who was pope from 526 until 530. In those days, most of Italy was part of the Ostrogothic Kingdom. 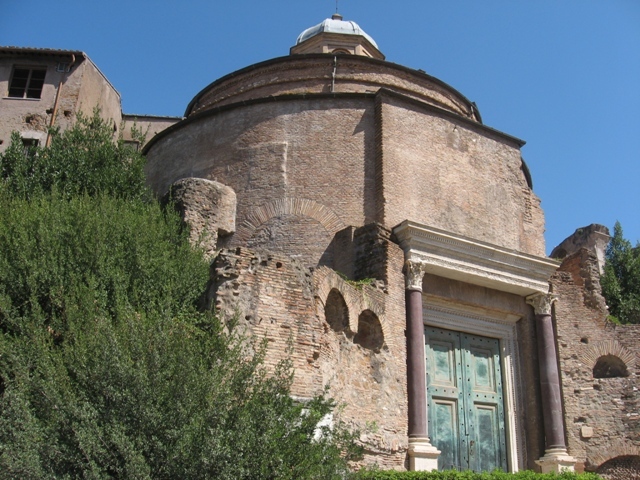 According to tradition, the Temple of Romulus and the Bibliotheca Pacis were donated to the pope by the Ostrogothic king Theoderic and his daughter Amalasuntha. Since Felix became pope on 12 July 526 and Theoderic died on 30 August of that same year, it seems likely Amalasuntha was primarily responsible for the donation, unless of course her father made some kind of vow on his deathbed. It is possible he wanted to make amends for his involvement in the death of Felix’s predecessor, pope John I, who had died in captivity. But this is all speculation. 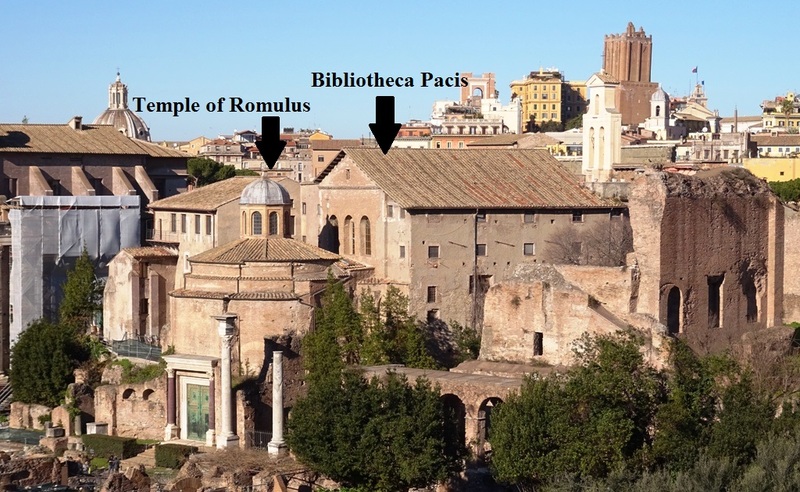 In any case, the Temple of Romulus and the Bibliotheca Pacis were combined to form a church. The original entrance was on the Forum Romanum. 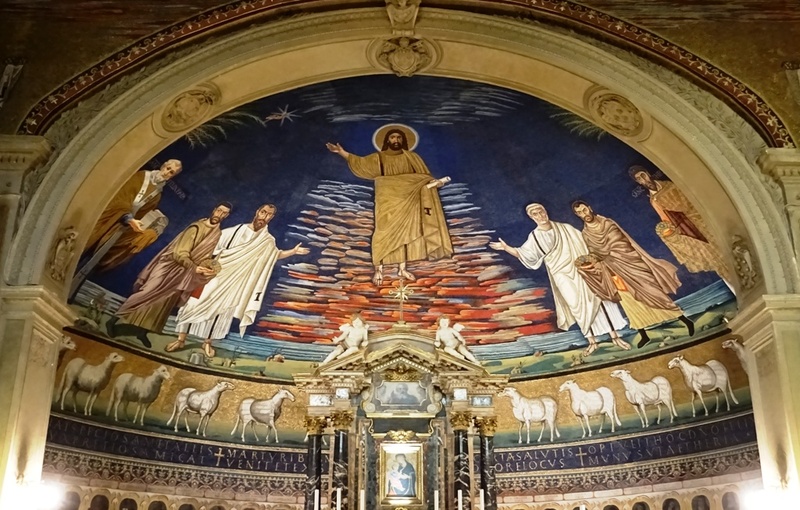 The church was decorated with a wonderful apse mosaic, which we will discuss later. 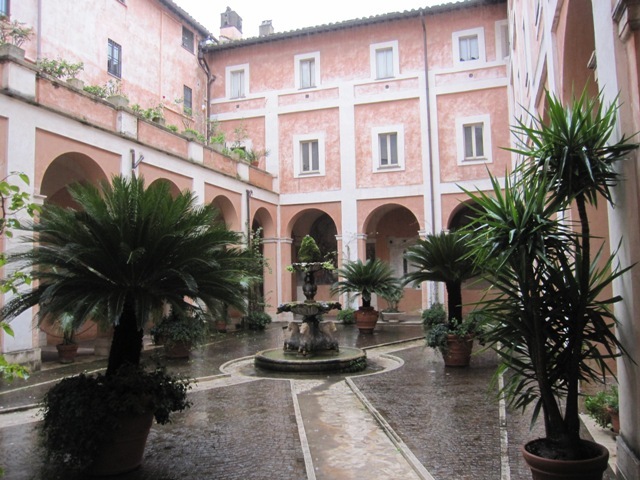 The inner court or cloister of the Franciscan convent. The basilica was restored in 1632 by pope Urbanus VIII (1623-1644; born Maffeo Barberini, see Rome: Palazzo Barberini). Urbanus made the important decision to raise the floor of the church by seven (!) metres. A new entrance was created on the other side and use of the Temple of Romulus was discontinued. A Franciscan convent had already been added to the church in the previous century and it is through the inner court of this convent that one enters the Santi Cosma e Damiano nowadays. The church is a popular location for weddings. The most spectacular attraction of this church is, for obvious reasons, the sixth century apse mosaic. It looks huge, and that is of course because the church floor used to be seven metres lower. Although many saints are portrayed on the mosaic, only Jesus Christ has a halo. We see Christ at his parousia (Greek: παρουσία), his Second Coming. He has a torah scroll in his left hand and is standing on pink and white clouds. It looks like he is descending the Stairway from Heaven. Christ is flanked by the Apostles Paulus (Paul; left) and Petrus (Peter; right) who introduce the Saints Cosmas and Damianus to Christ. Since they are twins, it is not possible to tell who is Cosmas and who is Damianus. Pope Felix is portrayed on the far left of the conch, holding a model of the church in his hands. There can be little doubt about his identity, as the caption reads SANC FELIX PAPA. Note the phoenix – a symbol of resurrection – sitting above him in the palm tree (for a similar scene, see the Santa Cecilia in Trastevere). The figures are all standing on the shores of the river Jordan. The style of the mosaic is much more realistic and classical than the later Byzantine style mosaics in churches such as the Santa Cecilia or the Santa Maria in Domnica. The 6th century apse mosaic. There can be some debate about the figure on the extreme right. The mosaic itself states that he is SANC THEODORVS, or Saint Theodorus (Theodore in English). That is only partly helpful, as there were at least two Saint Theodores. Art critic Robert Hughes has argued that the figure may in fact be Theoderic, the Ostrogothic king who donated the buildings to the pope. While this is a tempting explanation, it is also highly implausible. Theoderic was never canonised, so the SANC(TVS) text cannot apply to him. Theodoric, though a Christian king, was also a heretic. The Ostrogoths were Arians, Christians who did not believe in the divine nature of Christ and thus rejected the orthodox position. 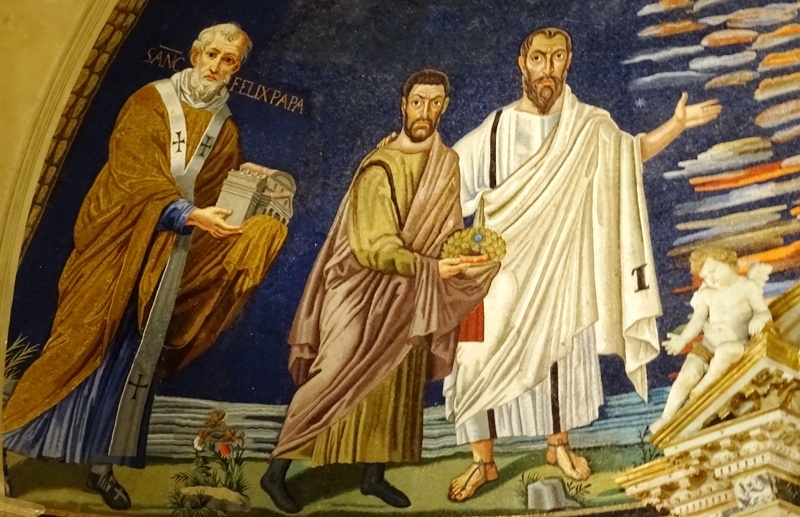 Surely pope Felix would not have included a heretic on his apse mosaic. 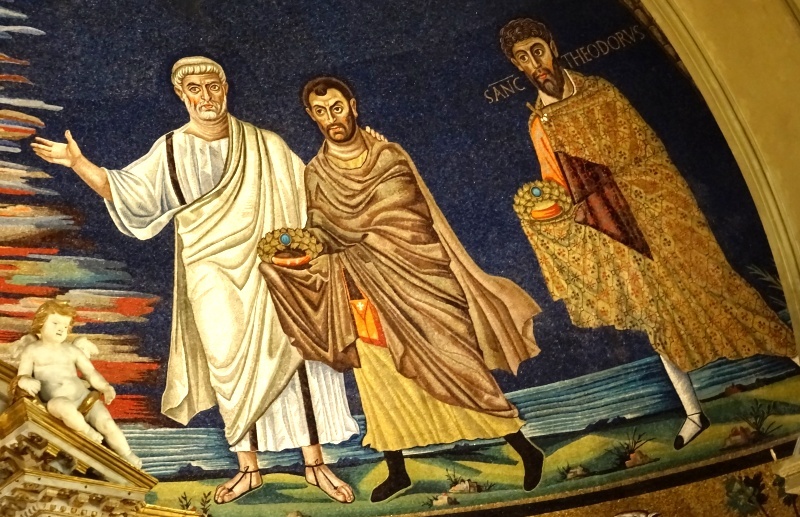 And there are more rebuttals: the mosaic clearly says THEODORVS, while Theoderic in Latin would be THEODERICVS. These are completely different names. ‘Theodorus’ is from Greek Θεόδωρος, ‘gift of God’, while Theoderic is Germanic and means “people-ruler”. It is best to reject Hughes’ suggestion. A verse the artist clearly chose to ignore. The lamb looks quite normal, apart from the oversized tail, which makes it look like a leopard. To the left and right of the lamb are seven candlesticks (“and there were seven lamps of fire burning before the throne, which are the seven Spirits of God”; Revelation 4:5). In the extreme left corner is a man with wings, in the extreme right corner an eagle. Both are holding a book, presumably the Gospels according to Matthew and John, for the man and the eagle are the symbols of Matthew and John respectively (“And the first beast was like a lion, and the second beast like a calf, and the third beast had a face as a man, and the fourth beast was like a flying eagle; Revelation 4:7). The other two evangelists are regretfully missing, as are most of the “four and twenty elders [that] fall down before him that sat on the throne, and worship him that liveth for ever and ever, and cast their crowns before the throne”. All that is left are a few extended arms with crowns that are stretching out to the lamb in the centre. See Santa Prassede for what the scene may have looked like originally. Fresco of Christ as the Crucified King. The first chapel on the right has a fresco of a crucified Christ that is fully dressed. The website of the Franciscans that are in charge of the basilica claims it is from the eighth century. 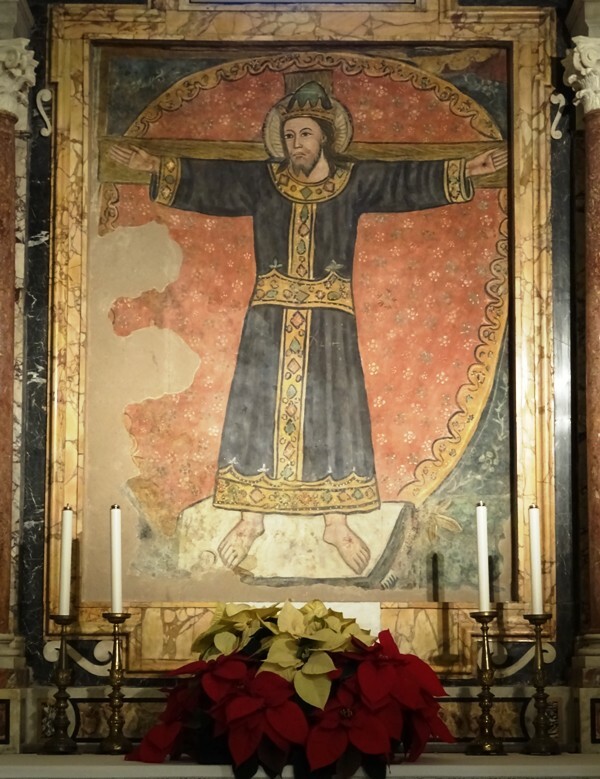 It states that “The crucified Christ is vested in a Colobio, that is the garment of the Byzantine emperor to signify that on the cross He has become the King of the Universe.” The Churches of Rome Wiki claims the icon is some 500 years younger and is from the thirteenth century. Again, I do not feel qualified enough to give a reasoned opinion on this issue. On the fresco, Christ is wearing expensive looking robes and a crown. Rather oddly, while his left hand shows clear signs of a stigma, his right hand seems to be intact. Santi Cosma e Damiano on Churches of Rome Wiki. Update 15 January 2017: text and images have been updated.